Workers at the National Gallery in London have begun a five-day strike after talks to resolve a row over privatization broke down. Members of the Public and Commercial Services union (PCS) have walked out over a decision to switch visitor services to a private company. Nearly 250 workers are expected to take part in the action, which received a 9:1 vote in favor. Bosses at the gallery last year announced plans to privatize nearly all staff positions, including those responsible for the collections and those who assist the six million annual visitors. They are also reported to have U-turned on the decision to pay staff the London Living Wage. 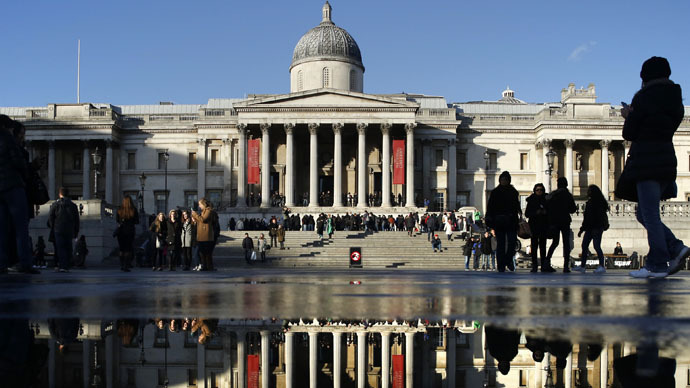 The PCS claims the National Gallery are now the only major cultural venue in the capital not to pay the rate. Nicholas Penn, Director of the Gallery, however, said plans to pay the staff the rate are still on course, and in order to free up the requisite funds it’s necessary to privatize visitor services. “The proposed changes are necessary to enable the National Gallery to increase income in the face of a reduced grant and increasing maintenance and running costs, and to enable it to pay all staff a minimum of the London living wage,”he added. The conciliation service Acas hosted five months of talks, which ended without agreement, resulting in calls for strike action. PCS general secretary Mark Serwotka said: “This five-day walkout will put the National Gallery in the spotlight for all the wrong reasons. It further emerged that a trade unionist and senior National Gallery CPS member present at the Acas talks had been suspended by management on the eve of the strike. In what protesters called a “disproportionate act of unfathomable bad faith,” the gallery suspended Candy Udwin, alleging she was responsible for a breach of commercial confidentiality after sharing a document detailing the cost of using a private company with her full time union official. Serwotka said the move would damage the gallery’s reputation. “This dispute and the sell-off plan are putting the global reputation of the National Gallery at risk. “Suspending one of our senior reps on the eve of our strike is a disproportionate act of unfathomable bad faith and not only should she be reinstated immediately, the gallery must commit itself to full and proper negotiations,” he added. The gallery already outsourced some of its security to the private firm CIS earlier in the year.